to stitch image1 and image2 together in a single column. Ideally all your images will be the same size. You can do this with lots of images using wildcards. Great tip! 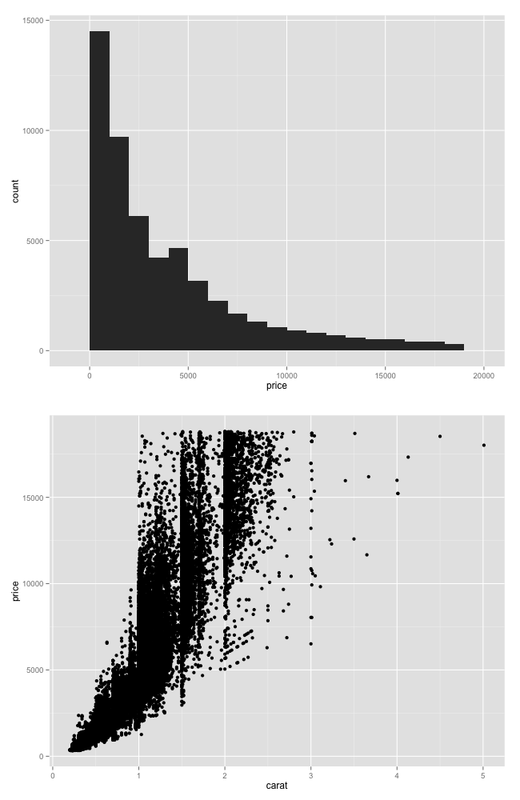 I've been struggling with this aspect of ggplot2 for a while. Great!! I was looking for something like this just today! I started learning ggplot2 a couple weeks ago, so maybe I'm missing something. After I load the library(ggplot2), arrange() isn't showing up as a function. I tried loading library(ggplot), to see if it was in there, but still no luck. Any idea? ... I've been looking for this solution, but the no-arrange() is getting in the way. Dan, the arrange function is not included with ggplot2. You have to copy and paste the code in the first box above to get it to work. Great bit of code... But.. is there a way to output to a file? I haven't had success with this either. Just use the GUI to save the image as PNG or PDF. I'll post a solution if I find one. I get the following error when I do this. note that this function is included in the gridExtra package, with the name grid.arrange() and a few more options. Great trick, thanks. How to go about having two plots share the same x-axis? Thank you Stephen Turner. It has been great use your code. Thanks. how do you control the space between the plots when using "arrange function"? Apologies - I updated the code (and renamed the function to arrange_ggplot2). The problem is newer versions of ggplot2 don't automatically load the grid package, so you have to load it manually. I put this in as the first line of code. Give it a shot now. Thanks Steven! My google searches seem to end up on your blog fairly often with helpful results. I also found this package (http://code.google.com/p/gridextra/) which may be useful as well. Thanks for sharing. I modified this code above years ago from something I found in a mailing list or forum. I think eventually this functionality became part of the gridextra package. Thanks Steven for the code. It´s has been very useful !! One question. I have a plot of 5x3 and I would like to reduce the blank space between plots. Is it possible? is the margin something that is a constant when using this function or is it an function of the plot size? Also how can we reduce this and increase size of plots?